Standard walkers have four legs with no wheels. Rollators have 3 or 4 legs all with wheels. Front wheeled walkers have wheels on only the two front legs. The two wheels are usually fixed in place, unlike the swivel wheels in 3 wheeled walkers. A front wheel walker provides extra stability and can help you move over various types of terrain. When using a front wheeled walker, you only need to raise the back end of the walker slightly to move forward. Why Use a Front Wheeled Walker? 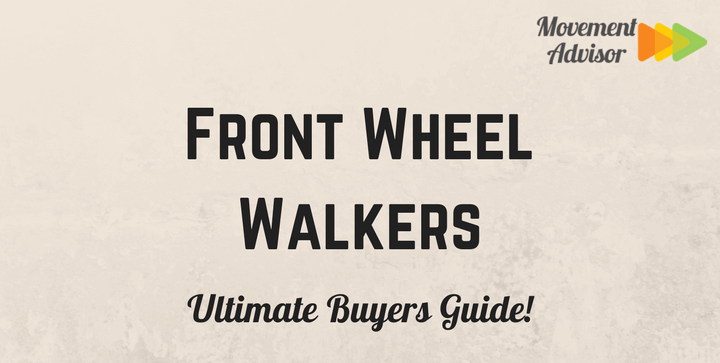 The greatest benefit to using a front wheel walker is increased mobility. With wheels on the front end, you don’t have to lift the walker every time you take a step. If you don’t have the upper body strength or endurance to use a basic walker comfortably, a wheeled option can still provide balance but makes movement easier. You can move faster with a front wheel walker, but it’s still grounded by the two back legs. Many products offer slip-resistant caps or glide caps for the rear legs. Slip-resistant caps are made of a material like rubber, which prevents the walker from slipping on smooth surfaces. Glide caps, or glides, help a walker move more smoothly and quickly across a surface. Some people have used tennis balls to achieve the same purpose, but professionals recommend using walker glides. A front wheel walker can be more convenient, but it poses a slight risk that prevents it from being suitable for everyone. Since this walker has wheels, you may accidentally push it too far away from you. Users need to be careful not to bear too much weight onto the walker too suddenly. You should never attempt to use a front wheeled walker to go up or down stairs. Those who need support mainly for balance will find front wheel walkers the most suitable. In other situations, you might want to consider another type of walker or rollator. Basic walkers with no wheels provide the most stability and can bear large amounts of weight. You never have to worry about them accidentally rolling or feeling unstable. If you’re looking for more mobility, including greater turn radius, speed, and the ability to maneuver in narrow or crowded spaces, a 3 or 4 wheeled rollator might be a better fit. Many walkers are made of aluminum or steel. While aluminum provides a lightweight but sturdy walker, steel is still stronger and longer-lasting. Most front wheel walkers use a 1-inch diameter frame. You’ll often hear companies advertising their use of “anodized” aluminum. Anodizing a metal is like giving it a finish. The result is aluminum that is more durable and resistant to corrosion. It’s used in skyscrapers to satellites to prolong the life of the metal and is environmentally friendly. While handgrips can seem minor, they will be the area where you place most if not all of your weight. Some handgrip options are ribbed, which provides texture and helps you keep a firmer grip. A handgrip may also be contoured or shaped so that your weight is spread more evenly across your hand. The shape of your handgrips can help prevent injury to the wrists. A few walkers contain latex in their handgrips, so if you have any latex allergies, be sure to check for a latex free label. While you should make your own measurements before purchasing a walker, it’s a good to have the option to customize. Your height can vary based on the shoes you wear. You might find that you prefer holding your walker a little higher or lower than you originally measured. Keeping your wrists at a comfortable angle is vital to proper and healthy use. Being able to adjust your walker will height will ensure you keep the best angle and posture as you enjoy your mobility. Overall Dimensions: 16.75"(L) x 25"(W) x 32"(H); Width Inside Hand Grips: 18"; Width Inside Back Legs: 20.75"; Handle Height: 32"-39"
Drive Medical’s Trigger Release Folding Walker is a brushed steel color, but also uses anodized aluminum that is one inch in diameter for a light and sturdy product. The handgrips are soft, ribbed, and contoured for maximum comfort and grip. The walker comes with glide caps and glide covers for its rear legs, which allow you to walk on a greater range of surfaces. The trigger button system lets you fold your walker without taking your hands off the supportive grip. This Drive Medical walker uses 5-inch wheels, and its overall dimensions are 25 inches wide by 16.75 inches long. 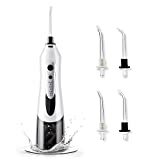 The height is 32 inches but can be adjusted up to 39 inches. This product supports up to 350 pounds and weighs only 7 pounds. The Drive Medical Deluxe has 5-inch wheels and vinyl contoured hand grips. The buttons are easy to push with any part of your hand include the fingers, your palm, or the side of your hand. It includes glide caps for the rear legs to provide a smooth walk over the majority of surfaces. This walker is made of aluminum with a one-inch diameter, making it both lightweight and sturdy. You can adjust the height from 32 to 39 inches high. The overall width is 24 inches, while the length is 17.5 inches. It weighs only 7.5 pounds but has a 350-pound weight capacity. The Lumex Everyday Walker uses a one-inch wide aluminum frame for lightweight strength. Its dual release system allows you to fold your walker without additional help. Its wheels are fixed and 5 inches in diameter. Glide tips for the rear legs are also available, allowing you to walk on a range of surfaces. The Everyday Walker comes in blue, gold, pink, and red. It weighs 8 pounds and can support up to 300 pounds. Overall, the walker is 20.2 inches long, 25.5 inches wide, and 39 inches tall. STRONG SUPPORT YET LIGHTWEIGHT. Each attractive walker is crafted from anodized aluminum which makes it strong enough to support 250 pounds, but also lightweight and easy to carry. It only weighs 7 pounds! COMPACT AND EASY TO OPEN AND CLOSE. Folds down to only a 4 1/2 inch width for storage. Just press down on the button at the top to release it. ADJUSTABLE HEIGHT. The walker is adjustable from 32 to 38 inches in one inch increments, meaning you can set it at the height most comfortable for you. The Duro-Med DMI Light is another lightweight anodized aluminum walker, as its name suggests. It has 5-inch wheels and has rubber tips for slip resistance. A steel cross brace provides additional support. 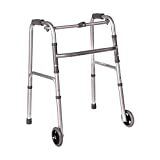 This walker comes in four metallic colors: silver, black, blue, and pink. You can add even more flair with colored rubber tips, but be aware that the product does contain latex. The DMI Light weighs just 5.5 pounds, but it has a weight capacity of 250 pounds. When folded down, the walker is only four inches wide. It features a two button release system to open and close the walker. You can adjust the height according to your comfort, from 32 to 38 inches high. Molded foam handgrips feel soft and comfortable to grip. The wheels are also removable. The overall width of this walker is 25 inches, while the distance between the handles is 17 inches. This Deluxe 2 Button Walker by Ez2Care has strong but light, anodized aluminum frame with a soft silver color. Its wheels are 5 inches. Handles are comfortable and soft to grip. The back legs have rubber tips to that are slip-resistant. The two buttons to fold this walker help you easily fold or extend your product. You can adjust the height of this walker from 32 to 39 inches high, in one-inch increments for greater comfort and customizability. This walker has a weight capacity of 250 pounds.